Here are some of the questions about IFR radio procedures I’m asked most often. Q: Am I required to use my call sign at the beginning or end of my transmission? A: According to the Aeronautical Information Manual (AIM), you may use your call sign at the beginning or end of a transmission. Countries following the International Civil Aviation Organization’s (ICAO) rules for air traffic control state one’s call sign must be added to the end of every transmission. Here in the U.S. you may begin or end with your call sign. Q: When cleared for an instrument approach, do I have to read back the exact title of the approach procedure ATC cleared me to fly? A: Yes and no. Sorry for that wishy-washy answer but here’s the hard truth. If Approach Control clears you, for example, for the ILS Zulu Approach, Runway 18, and you read back “[Your call sign], cleared for the approach,” likely the approach controller will not ask you to repeat your read back to include the name of the approach. Approach controllers know intercepting a final approach segment is a very busy phase of flight. The controller will not pester you for greater detail in your read back during this phase if you omit the name of the approach. However, if you read back, “[Your call sign], cleared for the ILS Yankee Approach, Runway 18,” and you were cleared to fly the ILS Zulu Approach, Runway 18, the controller will demand a correct read back of the cleared approach. In this example, an ILS Yankee approach differs procedurally from an ILS Zulu approach even though both approaches are ILS’s and both lead to the same runway. The controller will want verification you are about to fly the correct procedure if you read back the wrong name. Q: What is the exact phrase I should use to tell a controller I need a clearance repeated slowly? Q: When given a clearance to descend “at pilot’s discretion” do I need to tell the controller when I initiate the descent? Q: If ATC tells me to descend to 8,000 but I’d like to remain at my current altitude as long as possible for fuel savings, turbulence avoidance, etc, is it okay to ask the controller for the option to descend “at pilot’s discretion”? A: Sure, if you really want to mess up the controller’s plan. Almost always, when ATC tells you to descend, it’s for flow planning or traffic deconfliction. When you ask for “pilot’s discretion” you are asking the controller to recalculate his flow plan or to juggle his traffic priorities to prevent a traffic conflict. He may help you out but your request will probably throw a wrench in the works. I strongly urge to you to not make this request, even if you hear other less considerate pilots do it. Q: Got any tips on how to copy a route clearance? A: Yes, but there are far more than I can include in this single article. 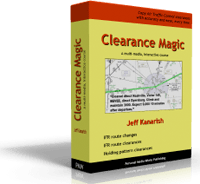 I have a complete course in how to copy route clearances in a program I created called “Clearance Magic”. The program is available at IFRclearance.com. Yep, that was a shameless self-promotion. While I’m on a roll, I’ll also point out the big book at the top of this page, Radio Mastery for IFR Pilots, has a complete discussion of IFR radio procedures, techniques, and hands-on exercises to make you a better IFR communicator. You may have a question I haven’t addressed in this article. So please, go ahead and ask. 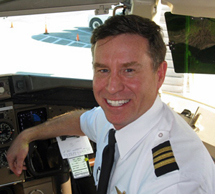 I’m right here at Jeff@ATCcommunication.com. Answer to the question asked in IFR Flight Radio Newsletter, Issue 6: A visual approach. Newsletter? Absolutely. If you aren’t in on my free newsletter and you’re mildly curious, check out the details in the right column of this page.